The autumn sky shows the transition from the summer Milky Way, through the "watery" constellations of autumn, to the bright stars of winter. Look up into the sky this week to see why autumn is the favorite season for many skywatchers: You can get your last look at summer stars and, if you stay up late, your first look at winter stars. Best of all, it gets dark earlier and the night temperatures are still comfortable. Our graphic shows a panorama of the sky looking south just after it becomes fully dark. After the change to standard time this weekend, this is the view at around 7 p.m. 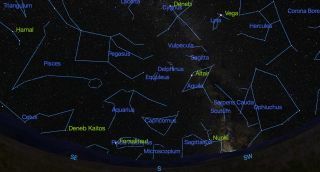 It's not too late to revisit some of the popular summer objects: double stars Albireo and Epsilon Lyrae, the globular clusters in Hercules and Ophiuchus, the Ring Nebula in Lyra and the bright nebulae and clusters of Sagittarius. Looking south, the upside-down triangle of Capricornus rides high. Its rightmost star, Algedi, can be seen as a double star to the naked eye. Above Capricornus, just to the left of Altair, is the tiny constellation Delphinus, the dolphin, one of the few constellations that actually looks like its name. It's worth also exploring the region between Altair and Albireo, where you will find two of the finest deep-sky objects: Brocchi's Cluster, popularly called "the coat hanger," and the Dumbbell Nebula, one of the largest and brightest planetary nebulae. Many of the constellations in the autumn sky have watery associations. These include Capricornus (the sea goat), Delphinus (the dolphin), Aquarius (the water bearer), Pisces (the fish, plural), Piscis Australis (the southern fish, singular), and Cetus (the whale). Most of these are lacking in bright stars, with the exception of Pisces Australis, which contains the first magnitude star Fomalhaut, the first star to have one of its planets directly imaged by the Hubble Space Telescope. Although Aquarius is dim in comparison to other stars, it contains a number of fine deep-sky objects, including the globular cluster Messier 2, and two fine planetary nebulae, the small bright Saturn Nebula and the huge Helix Nebula. The latter is probably the planetary nebula closest to the sun, about 700 light-years distant, and as a result appears very large in size, almost as large as the moon. Because of its large angular size, its light is spread out over a wide area, making it very hard to see. You will need a narrow band filter on your telescope to spot it. Right in the upper-left corner of the graphic are the two largest and brightest galaxies in our neighborhood, the Andromeda Galaxy and the Triangulum Galaxy. These are located symmetrically on either side of the second pair of stars eastward from Alpheratz in Andromeda. The Andromeda Galaxy, to the north, is large and bright. If you live in a city, you will need binoculars to see it, but sharp-eyed observers in the country, including myself, have spotted it with their unaided eyes. The Triangulum Galaxy is almost as large, but nowhere near as bright as Andromeda. It is best seen in small binoculars. Oddly, it is very hard to see in the narrow field of a telescope because its dim light is spread across such a large area. Stay up until midnight and you will see him, too. Editor's note: If you capture a stunning view of the autumn night sky and you'd like to share it with Space.com and our news partners for a story of image gallery, send photos and comments in to managing editor Tariq Malik at: spacephotos@space.com.